Each month (towards the end of the month), Revolutionary Paideia will honor a living or dead person who embodies (in some way) the notion of “unsettling, unnerving, and unhousing” this site represents. Revolutionary Paideia does not have to necessarily like the individuals it selects, but every effort will be made to honor someone for doing something that “unsettles,” “unnerves,” and/or “unhouses” people. When Revolutionary Paideia likes one of its monthly honorees, this will be openly disclosed. At the end of each year, Revolutionary Paideia will select a living person (or one who has died in the same year) as Person of the Year. Living people who have been selected as a Person of the Month are not ineligible for the Person of the Year award. Revolutionary Paideia’s inaugural Person of the Month award is presented to General Stanley A. McChrystal. If you do not agree with General McChrystal receiving this award, I would simply like for you to go ask President Obama if General McChrystal did not “unsettle, unnerve, and unhouse” him. Revolutionary Paideia supports General McChrystal because he was willing to break with tradition and criticize the current U.S. President and his administration. One of the core problems that General McChrystal expressed to a freelance writer for Rolling Stone with President Obama is his lack of engagement with the counterinsurgence efforts in Afghanistan. General McChrystal has had a history of being outspoken on issues. Before this incident, he had been outspoken about his advocacy for the “surge” strategy in Afghanistan before President Obama even had a chance to make a decision about whether he supported an increase in troops in Afghanistan. 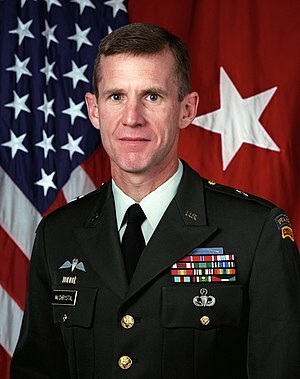 Although General McChrystal’s “surge” strategy was successful and President Obama supported it, many found that General McChrystal acted inappropriately. I just wonder why there was not this level of criticism for him as there was for his recent direct criticism of President Obama and his administration. When General McChrystal was interviewed by the freelance writer for Rolling Stone, he knew that what he was saying would eventually get back to President Obama and the members of his administration referenced during the interview. This did not stop him from disclosing his problems with President Obama and members of his administration about their handling of the war in Afghanistan. I agree with General McChrystal that President Obama has seemed to lack engagement with the efforts in Afghanistan. It took tremendous courage for General McChrystal to challenge the U.S. President in the way that he did. While people can view what he said as being disrespectful all they want to, I think this incident reveals a serious flaw in the military code of conduct: a Commanding General should have the right to speak his mind in public about how he feels about anything or anybody, including the Commander-in-Chief. While I would have preferred for General McChrystal to not have apologized for what he said, I understand the enormous political pressure his faced to cause him to give an apology. What is more important for me, however, is his great courage before he apologized. The apology represents his decency—not his cowardice. We need more people in America like General McChrystal who are willing to speak truth to power, and who are willing to tell people how they feel without being fearful of any repercussions. Now, I know President Obama really does not like dissent and I know that his creation of “a team of rivals” is a farce. He does not appreciate dissent—he made this clear when he “accepted the resignation” (also known as “fired”) of General McChrystal. Again, Revolutionary Paideia congratulates General Stanley A. McChrystal for being Revolutionary Paideia’s inaugural Person of the Month. Americans should be proud of the distinguished service of this solider, leader, and hero. I appreciate your service General McChrystal and love your candor!